Super Hero Boy: I wish everything made for babies was this portable. I wish everything made for babies was this portable. If you have ever had to pack a car with a baby in tow for just a simple weekend at the grandparents house you quickly come to the realization just how "unportable" baby stuff truely is. I honestly now understand why people buy mini vans when they have kids as I have never been as packed to the gills as I was the first time we packed up to go visit Connor's grandparents when he was three months old. Pack and Plays are great... and don't get me wrong I think they are a great thing to have for every family. With that said, pack and plays are heavy, bulky, and they take up a TON of space in the trunk. If only we had had an Air Crib sooner, it would have at least saved me several arguments over "how on earth will we fit all this crap in the car". 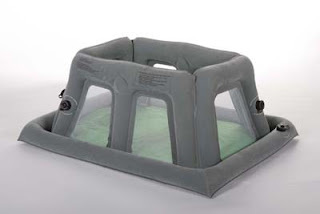 The Air Crib is a complete bed for babies under five months. Though its really more than big enough for Connor to sleep in at this point the fact that the sides are not 100% rigid makes it fairly easy for him to stand up and shimmy out. Up to the point he was pulling up though this would have been the PERFECT option for those nights away from home.. or even at his Aunt's house for nap time. I am sure once she sees this she will be sending me emails about how it would have been sooo nice to have had one back in the beginning. The Air Crib itself comes packed into its tiny little bag complete with everything you need : a hand pump, mattress, and a really pretty green sheet made just for the crib. My first thought taking it out of the bag was "oh great.. this will take forever to get the air in it with this hand pump". Boy was I mistaken, with only three or four pumps on each side of the crib the crib was up and ready to go. The mattress has a self inflating valve, which I find highly fascinating, so all you have to do to it is turn the little valve, wait a minute, and it magically inflates. The whole process including putting the sheet on the mattress took me all of four minutes and it was completely painless. It would have taken me a lot less time (easily less than two minutes) if I would have looked at the manual before I started to find out that that I needed to close the valves before I tried to put air in!! Once it was all together, I had a moment of sadness as I realized I wouldn't actually get a chance to use it for quite some time (or that is until Connor actually has a little brother or sister to share it with) but for those of you that are pregnant or newly parents and your in the middle of that pack and play debate... believe me if you have a small car or plan on spending nights away at all, or even just need a compact solution for your baby to sleep at a family or friends house, you must check out the Air Crib. If you want one of your own you can buy one directly from Air Crib or check them out on Amazon! This is a great idea. It would have been nice to have one of these a few years back, we had a circular portable that folded, but it was bulky and heavy. Thanks for the info.